Cucumbertown, although it may not have the coolest name (see what I did there? ), has a backstory that is very much a sign of the growing democratization in the way startups raise funding. Let me explain: The startup was initially founded by Cherian Thomas, an Indian entrepreneur and former engineer at Zynga, and today has a team of four people. While one might assume that its employees all live near Thomas in his hometown of Bangalore, in fact each of them live on different continents — and they’ve never met each other in person. And yet, in spite of the fact that Thomas had never been to Silicon Valley until last month (or met his founding team in person), Cucumbertown is today announcing that it has raised a $300K seed round from a number of familiar names. The startup’s first round included angel investors like Naval Ravikant of AngelList, Paul Singh of 500 Startups, FarmVille co-creator Sizhao Zao Yang, founder of MightyText Maneesh Arora, early Google product guy Richard Chen and Sonique Player co-creator Tabreez Varjee. So, considering it has a remote staff and Thomas’ admission that it has few contacts in Silicon Valley or in the U.S. for that matter, how was the startup able to raise funding from these angels? The startup is one of the first companies to use AngelList Docs to source its angels, its new service that allows both angels and entrepreneurs to avoid legal fees while filling out term sheets and all the necessary paperwork that comes with raising and closing an early-stage financing round. Not to overstate, but this could have big implications for international entrepreneurs and founders who don’t have an expansive rolodex of investors and contacts in the U.S. or Silicon Valley. That being said, what exactly is Cucumbertown, and what are they up to? Thomas tells us that the startup’s mission is to give amateur cooks and chefs an easy way to publish recipes in a simple, frictionless and easy-to-use interface. 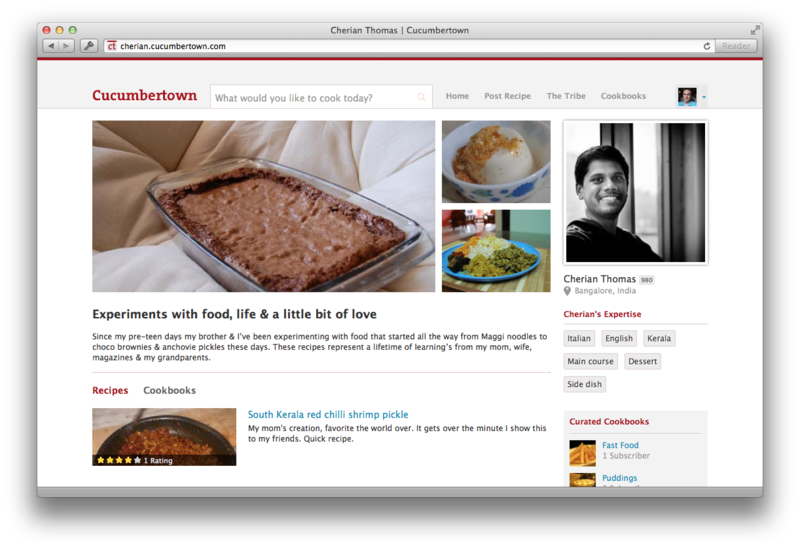 Cucumbertown aims to present culinary enthusiasts with an alternative to posting recipes and food-related content on WordPress, Tumblr, Blogger, and so on. The founder describes it as the Dribbble for cooks and recipes. Simply put, Cucumbertown aims to make it easy for anyone to write recipes and publish them in a community that contributes to recipes and posts by submitting pictures, adding tips, sharing the top content and rating their favorite submissions. Thomas said that he wants the platform to offer a frictionless entry-point to recipe-sharing for first-time cooks or those who aren’t already using similar apps, as well as providing a short-hand mechanic for advanced users to write recipes quickly. Like stenography for recipe creation, he says. After beta testing with 500 users over the past few months, Cucumbertown is officially opening up its “platform for food” to the public today. It is targeting amateur cooks and pro chefs, giving them a non-cumbersome way to establish a food-based identity on the web, craft recipes in a standardized way, include multimedia and publish their best concoctions. The startup aims to provide an attractive alternative to the WordPresses, Tumblrs and Epicurious-es of the world by enabling users to write recipes in less than five minutes, take pictures with their smartphones, upload them with a few clicks, and encourage sharing, conversation and interaction around their culinary content. To create an underlying social element by allowing amateur food critics to customize notifications related to content published by friends, the addition of tips, reviews and even to follow their favorite cooks. The idea is to give them a better way to showcase their recipes and food love as if they are works of art. For more on Cucumbertown, check it out at home here.